We’d love your help. Let us know what’s wrong with this preview of The Spirit Keepers by J.K. Winn. One of Sandy Jacobs' ten year old students and his family are accused of witchcraft. Blamed for the mysterious deaths of two San Anselmo Pueblo children, they're terrorized by "Boogeymen" Kachina. Sandy rushes to their aid, but her actions inflame the perpetrators and arouse the opposition of Native born faculty member, Ben Rush. San Can you escape the wrath of the Spirits? To ask other readers questions about The Spirit Keepers, please sign up. I enjoyed this new-to-me author and the first book in this series. Very informative and good character and plot development. I'm ready to read the next book in this series. Thank you Ms Winn! Sandy Jacobs has moved to New Mexico to get away from her past life in Philadelphia. Desperate for a change and trying to get over the loss of her son she jumps at the chance to teach in the small town of San Anselmo. Too bad Sandy's problems seem to have gotten worse when she gets there. Upon arriving she watching innocent sheep get gunned down. When she waves someone over to discover Ben Rush a Native American hottie with a flirtation smile. After telling her everything is taken care of she feels at ease. Trying to set up for school and her apartment she sees Ben again and realizes he works at the school with her. Almost instantly a connection is formed. One day Dixon one of Sandy's students comes to her with a bullying problem Sandy is quick to help the child and his family, but the problem may be too big for Sandy to handle on her own. There are children dying and the family being blamed is none other than Dixon and his family. Now Dixon's family is being shunned, accused of witchcraft, and is often visited by the Kachina or boogeymen. While Sandy goes to all the tribal and anyone who can help she is continuously turned down, everyone claiming the family must deal with it themselves. When other events and threats begin to take on a dark edge the only person still trying to help Dixon's family is Sandy. When Dixon's family's house gets set ablaze with Dixon trapped inside Ben rushes in to save in. When Dixon winds up in a coma after the incident Sandy goes back to look for clues, only to come face to face with the perpetrators. I have to say I wasn't sure what to expect with this book. I truly enjoyed this book. The Spirit Keeper kept me on the edge of my seat wondering who the bad guy was until the very end. I couldn't believe who the bad guy was at the end. I loved the ending and was extremely happy with the ending. I am definitely pleased that I got to read a copy of this amazing book by J.S. Winn who is an amazing author. I hope that everyone is able to pick up a copy of this book!! I really enjoyed this book, and coming from a damp maritime climate, the descriptions of the cold, dry, Winter of San Anselmo had me hooked from the start. The Spirit Keepers is set in New Mexico, on a reservation, in 2000. It tells the story of a Philadelphia native, Sandy, who comes to teach in the local elementary school. She has suffered trauma in the past, and is seeking a change of scenery and life. There she befriends Ben, another teacher, who tries his best to guide her through the nu I really enjoyed this book, and coming from a damp maritime climate, the descriptions of the cold, dry, Winter of San Anselmo had me hooked from the start. The Spirit Keepers is set in New Mexico, on a reservation, in 2000. It tells the story of a Philadelphia native, Sandy, who comes to teach in the local elementary school. She has suffered trauma in the past, and is seeking a change of scenery and life. There she befriends Ben, another teacher, who tries his best to guide her through the nuances of life in her new surroundings. Ben is a member of the native community, but grew up with an adoptive family in the mid-west before working in Central America and returning to his spiritual home. 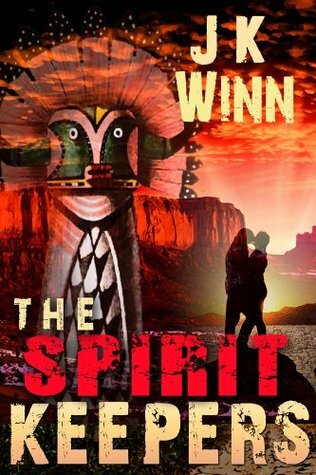 When Sandy witnesses a family being intimidated by ‘bogeymen’ known locally as Kachina, she cannot accept it as the work of the ‘spirits’ and although confronted on every side to leave these matters to the tribe, she continues to investigate it. The family are labelled as witches, and it appears that the spirits are trying to scare them off the reservation, but why? The deeper she digs, the more sinister the actions become, but Sandy’s resolve doesn’t waiver. This book gives an interesting insight into life in the Southwest, versus that of our accepted westernised society and whilst we would all like to think that we would be as brave as Sandy, would we really have the strength of character to step outside our comfort zones? The Spirit Keeper is an absolutely fantastic, original story, unlike anything I've ever read. Starting a new life in New Mexico, Sandy finds herself miles away, in more ways than one, from her hometown of Philadelphia. Everything is different, from the local's beliefs to the children she teaches. When one of her students, Dixon, is being bullied, Sandy walks him home,and is before long welcomed into the Edakee family, who see her as their Aunt. As Sandy spends more time with the Edakee's, she discovers that Dixon being bullied is just the tip of the iceberg for this family, who are being terrorised and threatened because the people believe they are witches. Sandy must prove their innocence and find out who is behind these terrible attacks once and for all, before someone is seriously hurt. This is a story that will pull at your heart strings many, many times, a tale of loyalty and betrayal, and of course, love. 4 well earned stars. I picked this novel up on a free promotion. Initially, when I saw the words "a native American romance" I was thinking it would be Native American's in tepees living on the plains. At first when I realised it was modern day and a very different culture I was disappointed, but I was quickly drawn in by the story. The culture was described vibrantly, as well as in terms somebody with limited knowledge could follow. The characters felt dynamic and alive. The plot was fascinating with just the right I picked this novel up on a free promotion. Initially, when I saw the words "a native American romance" I was thinking it would be Native American's in tepees living on the plains. At first when I realised it was modern day and a very different culture I was disappointed, but I was quickly drawn in by the story. The story of a beginning teacher coming to the San Anselmo Pueblo turns into a mystery as Sandy tries to figure out who was harassing one of her students. The author knows the pueblos and the Native American way of life. There's also a love story and the mystery of who wins Sandy's heart. I enjoyed some of the Native American information in the book but found the writing plodding and too flowery for me. The plot was interesting with some twists; and, as with many protagonists, actions were taken that you or I would not have dared without backup or at least having someone with us. But I guess that would remove much of the danger and excitement from the book! Author Winn is a good story teller, although her style is obviously from a woman's perspective of not being familiar with some of the mechanical and such physical elements, ie. trucks, guns, pragmatic reactions in several situations. Still, it was worth reading. the romance which I did not believe. Was very pleasantly surprised by this novel. Was full of surprises and suspense. depicted the native American culture, showed that their myths and beliefs can be manipulated for personal gain. The plot was well developed with no loose ends at the conclusion of the book. Each character was believable. Very interesting read. This is a very good mystery with lots of twists and turns. I read it in one evening because I couldn't put it down. I would recommend it to anyone who enjoys a good mystery. I was an editor on the book so I won't be writing an official review, but marking it for my GR records. The story was very interesting. It just wasn't my usual sort of book, so not a higher rating but fans of the genre I think will like it more. An over simplified romance novel. There were some errors that should have been caught by the editor. It was an ok read for me. This was an interesting book in that if kept you guessing until the end who was responsible. You sort of had an idea. The book is set up for several sequels. Free on Amazon today, 03-06-14. I really enjoyed this with the setting in NM. The author did a wonderful job on Pueblo culture and human emotions.